Conspiracy theory Government A Science Icon Died 17 Years Ago. In His Last Interview, He Made A Warning That Gives Me Goosebumps. Carl Edward Sagan inspired a generation of scientists with his work in and out of the classroom. But he didn’t always present science with cheer. In this clip, he passionately defends science with a grave warning. It’s something we all need to hear. Carl Edward Sagan (/ˈseɪɡən/; November 9, 1934 – December 20, 1996) was an American astronomer, astrophysicist, cosmologist, author, science popularizer and science communicator in astronomy and natural sciences. His contributions were central to the discovery of the high surface temperatures of Venus. However, he is best known for his contributions to the scientific research of extraterrestrial life, including experimental demonstration of the production of amino acids from basic chemicals by radiation. Sagan assembled the first physical messages that were sent into space: the Pioneer plaque and the Voyager Golden Record, universal messages that could potentially be understood by any extraterrestrial intelligence that might find them. He published more than 600 scientific papers and articles and was author, co-author or editor of more than 20 books. 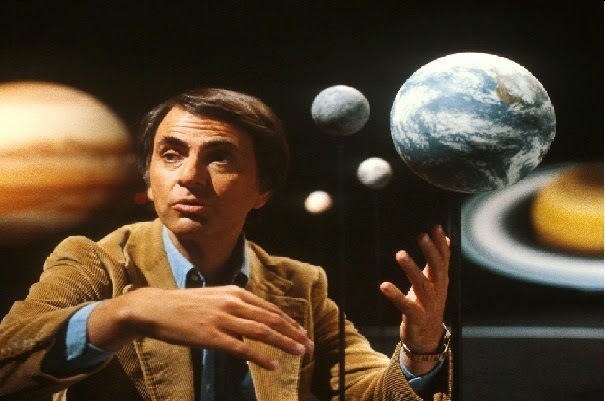 Sagan is known for many of his popular science books, such as The Dragons of Eden, Broca’s Brain and Pale Blue Dot, and for the award-winning 1980 television series Cosmos: A Personal Voyage, which he narrated and co-wrote. The most widely watched series in the history of American public television, Cosmos has been seen by at least 500 million people across 60 different countries. The bookCosmos was published to accompany the series. He also wrote the science fiction novel Contact, the basis for a 1997 film of the same name.